Berkeley's Freight & Salvage Coffeehouse provides a comfortable setting for artists and fans just 1 block from Shattuck Avenue...and all it has to offer. On Friday night, Bay area native Melody Walker and partner Jacob Groopman took the stage in front of a modest crowd who braved the first rains of the winter season. The duo took time prior to performing to announce that the show was being recorded for a future live release. The duo has spent a tireless summer and fall touring all across the States. They seem to have a mission to bring their California fusion Americana style to other parts of the country. On this years release, Gold Rush Goddess, they take listeners on a journey around the lesser known parts of NorCal- Martinez (Melody's hometown), Eureka and Richmond all play backdrop to various songs on the album. They proceeded to get in tune and start the show. Set 1 included 5 songs from the GRG album plus a few other covers. 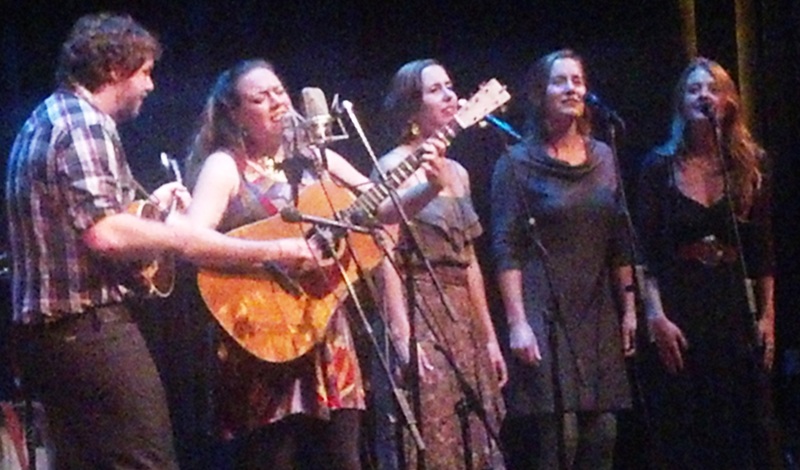 "Do What You Love Blues" included backing vocals by local singers, the T-Sisters. While "Family Band" was set to include audience participation for the live album, the highlight was in "Stars Align" and "Black Grace". Both songs showcase not only the proficient instrumental elements of the duo but the power of Melody Walkers voice. Her ability to sing from the heart and soul draws the listener in. While Jacob Groopman is solid on the guitar, banjo and mandolin- its clear this band is based around the strength of Walker. Her strong, clear vocals carry each song and keep you asking for more. Set 1 ended with an Americana version of Paul Simon's "Graceland". While fun, they seemed to lose some steam instrumentally. Set 2 included a few remaining songs from Gold Rush Godess. The consistent sound of Groopman's guitar, mandolin and banjo helped lay the foundation for songs like "Not Today", which also included another appearance by the T-Sisters, "Martinez" and "Caboose". While there were a few awkward moments in the second set (the T-Sisters audience participation in "Martinez" and the 4 hand piano play), there was also signs of taking the duo to the next level. Walker's one Pop song, "Gotta Write Love Songs" is another side of her artistic ability. She looked and sounded natural sitting at the piano for this catchy tune. However, in an attempt to provide some Pop styling by having Groopman play the same piano at the same time, it came across as campy. The duo works hard to connect with the audience and overall, they are successful. Freight & Salvage provides a nice comfortable, living room feel but I would prefer to see Walker in a festival environment where she would have the ability to really belt out her tunes and showcase her vocal power. The girl can sing and deserves the proper stage to do so.